A deep cleansing shampoo with Tea Tree Oil developed to thoroughly cleanse and penetrate each hair shaft removing excess oils and product build-up with rich lather. The healing properties of the Tea Tree Oil cleanse while the wheat amino acids help provide the principal building blocks of proteins and enzymes. 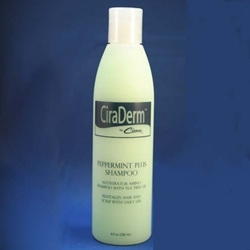 Works well when used in conjunction with the CiraDerm treatments and can be alternated with the Follicleanse Cleanser. 8 oz.